This post shows you the pretty island of Madeira. We make a Santana day trip from Funchal. To see the famous triangular houses we rented a car and took the steepest road up to Monte and on to Pico do Arieiro on the top of Madeira. On the north side we stopped at Ribeiro Frio and Faial. Santana is a village on the north coast of Madeira famous for its A-framed houses. We saw the houses and much more along the way. It was a great driving route that you probably can make on an arranged bus tour as well if that suits you better. And the first village we visited, Monte, can also be reached by cable car from Funchal. This is the facade of a traditional Santana house, called palheiro in Portuguese. Madeira is not a big island so the drive Funchal to north coast and back only makes 100 km and less than 2,5 hours direct driving time. But the more you stop the more time you will need, hopefully you can use the whole day. Our first stop was very close to Funchal, Monte 550 m above the city. Google maps told us to take the straightest road Caminho do Monte uphill and so we did. We had absolutely no idea how steep the road was and neither did we know that people were coming down the same road in toboggans, wicker baskets. The toboggans used one lane and when they came cars had to take the other lane. Our small rental car (it was brand new) had a hard time and made a terrible noise and there was some smoke but up we went. I’m not sure if I’d like to do that again but he next time to Monte we took another road. Why do people come down with such a strange mode of transport? – It’s an old tradition on Madeira. In 1850 they began to take visitors down this way and to bring them uphill there was the train. Toboggan is a thrilling way to return from Monte, even if the speed on a modern surfaced road is not what it used to be when the road was cobbled. Smartly dressed toboggan drivers, carreiros, sit at the foot of church steps and wait for passengers. They push and steer the sled and use their shoes as brakes. Try it, or walk down the road, it’s a nice four km distance to Funchal through old garden suburbs and the views are scenic all the way down. You can alternatively get up to Monte without renting a car, just take a cable car from Funchal’s Old Town. It is an amazing ride as well. The cable car goes up the green Joao Gomes Valley to Monte cable car station that is the only modern building in the village. There are also buses to Monte and another cable car from west of Funchal. I will now present the most interesting Monte sights. To see them all it might be wise not to combine them with a Santana trip. If you’re staying in Funchal you can make a separate trip to Monte at any time. Monte has a famous church Nossa Senhora do Monte from 1818, twin-towered and whitewashed – and it has a painted blue ceiling inside. It is Madeira’s most popular wedding church. And crowds also gather to the church in August when pilgrims climb up the 74 steps on their knees. There’s also the Capela de Coreicao, a pretty chapel on a small square close to the miradouro from where you get views of the valley. 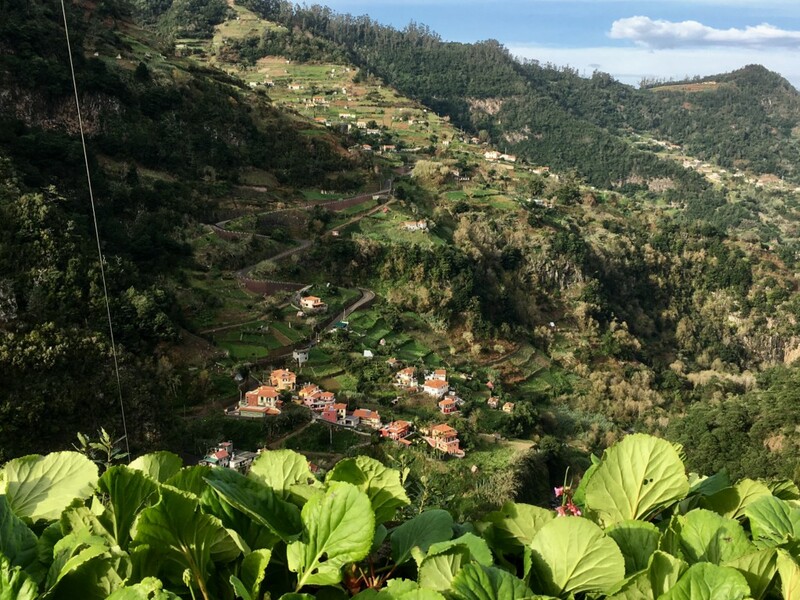 To see the Joao Gomes Valley you can also go levada walking. There is a path around the valley to Jardim Botanico. We tried the path but instead walked in Monte Palace Gardens. Monte has been Funchal’s garden suburb where many wealthy citizens escaped and built their quintas and palaces. The air was fresher and cooler than in the city and it was less noisy. Monte Palace was the villa of the English consul. The palace has a huge lush garden down the valley, 7 ha of size. There is a Madeiran laurisilva forest and a swan lake with grottoes and painted wall tiles that were rescued from Lisbon houses torn down. And there is a Japanese garden with red bridges and oriental plants and ponds. In total the garden has more than 100.000 different plants from around the world. The village of Monte itself is a sleepy village high on the hillside above Funchal. This is the central square Largo do Fonte with the old station building. The railway was closed in 1939 after a locomotive exploded and travellers were killed. The old railway bridge still stands there but is covered with plants from the public park below the bridge. So we left Monte and took the scenic Ribeiro Frio road uphill. The views to Funchal got even better and Monte too looked very nice from higher up. At 700 m the terraces ended and we came into a woodland with pines and eucalyptus trees. Eucalyptus used for timber was originally imported from Australia. I could really feel the sweet fragrance that made be believe I was in Australia. It was cloudy and a bit misty higher up which is said to be typical. The clouds hang on the mountains but getting still higher the skies get clear again. Australia has bush fires, I’m sure they don’t call them bush fires here but there had been some fires in places. I wouldn’t say it looked pretty but the road was good to drive and here and there we passed sheep and goats on the roadside. Soon we reached the top of the island which is a dry plateau. So different scenery and only about an hour’s drive from Funchal. Visiting Pico do Arieiro means a detour from the main road but not a long one. As we had been told he clouds disappeared – but it was terribly cold! Waht a fortune that we come from a cold country and are prepared to + 6 degrees and heavy winds! The photo shows the absolute summit of Pico do Arieiro, at 1818 m. Otherwise the mountain top is 8 m lower. Pico do Arieiro is the third highest peak of Madeira and since Madeira is so small you can see the whole island from there, including the highest peak Pico Ruivo. Below you can look back to Funchal. And here are views to the other directions. The landscape consists of brownish volcanic rocks which tells about the island’s origins. The whole island of Madeira has been created of volcanic forces which you can’t tell at lower altitudes where the ground is covered with vegetation, but up here you can see the volcanic rocks. The path looks easy here but I can tell you it will very soon get more demanding. There were some walkers, some of them well prepared and others not, they only walked a short distance just like us and returned. If you want to stay on this mountain top, there is a pousada (a hotel) and a cafe. And of course a souvenir shop is needed since even big vehicles like tour buses can reach Pico do Arieiro that is the most accessible of the high peaks. Driving down we could soon take off the down jackets which was nice. We entered the forest again and soon it was all laurisilva that Madeira is UNESCO World Heritage listed for. And in the middle of a lush laurisilva forest there was a small community. Ribeiro Frio means cold stream. The tiny community is built on both sides of the cold river that carries cold rain water from the mountains. The place looks like a rainforest with ferns and all other exotic plants. There are two restaurants, a souvenir shop, a chapel and a trout farm. And levadas. Two levada walks start here. One of them is the 11 km Portela walk that is a demanding one. It starts below the restaurant but you can easily walk a short stretch and return, it’s beautiful out there. To walk the whole route you need proper equipment, the path is steep and narrow in places. The other walk begins across the road. It is an easy 20 min walk to Balcoes (balcony), a lookout where you can see the valley. The tiny chapel looks so white and pretty and the red restaurant building of course has a plastic Santa Claus. It’s Christmas time. The trout farm takes fresh water from a beautifully landscaped levada. Madeira has built an irrigation system that brings rain water from mountains to where it’s needed. The system consists of narrow canals, levadas, and maintenance paths around them that can be used for walking. The network covers the whole island and totally there are more than 200 km of canals. So walkers are happy on Madeira and so are these trouts in their concrete tank filled with fresh mountain water. Between Ribeiro Frio and Faial the area is full of terraced fields. The first settlers of Madeira built them and sometimes used slaves from Africa as labour force until slavery was forbidden. It was hard work to conquer land from the deep mountain slopes. That land was needed to grow vegetables, fruit and grapes that were needed by people to live in the area. Lots of different vegetables grow around Faial. Here you can see pumpkins being dried in the air. It must be a common way of storing them since we saw this view in many villages. In addition to pumpkins cabbages, potatoes and carrots and other vegetables grow here and farmers can harvest them three times a year. The terraces look amazing, it’s like Bali rice terraces. And in between they have fruit trees: apples, pears, cherries and so on. What a beautiful unspoilt area, so different from the more inhabited south coast! There are at least two alternative roads you can take to Faial that is a small fishing village on the mountainside. There was a restaurant and a food store where we bought something to drink and takeaway sandwiches since we had to drive on. To see more on the way we took the upper road from Faial to Santana instead of the new tunnel road. There is a lookout where you get great views of Faial and the whole north coast. And that road too finally takes you to Santana. So we made our Santana day trip from Funchal for these houses. Of course we wanted to see the other places to but it initially started with these houses. And here they are, A-framed houses with thatched roofs, all painted in bright colours. These houses have been typical of Madeira but they only remain here. This kind of building style was used by the first Portuguese immigrants in the 16th century and A-frames became a tradition. This kind of houses are called palheiros in Portuguese. They are simple houses with a wooden interior. The living room and kitchen are downstairs and they sleep in the loft. Originally the bathrooms were outdoors but today they fit modern conveniences in the house. You can see triangular Santana houses along village lanes but these ones are next to the city hall and church. They are touristic houses where you also can go and look at the interiors. One of the houses is a flower shop and another one was selling souvenirs. I like it. In Santana they still build houses sticking to the old building style, maybe because the area has been isolated and a bit laidback. Getting to Santana from Funchal has been an effort until fairly recently when the fast express way was built. Many palheiros are bright in colour but not all. You can also see brown and dark colours that look equally beautiful. Maybe the dark ones look even more original? Many of the triangular buildings were used as storage rooms or cowsheds. At least we saw that kind of usage on hillsides but also in the village. And this one has a pumpkin growing on the thatched roof. We were visiting after Christmas and like every village in Madeira also Santana had a huge nativity stable outside the town hall. It all looked so great but the palheiros among Christmas things are the top! I hope people in all places in the world wanted to keep to their own traditions like the people in Santana. But like on every day trip it finally gets dark which means it’s time to start driving back. We decided to return along the fastest route from Santana, the new Via Expressa. Here you can see one of the many Via Expressa bridges, the one over the Ribeira Seca at Faial. The road is very fast and before you notice you reach the Santa Catarina airport north of Funchal. We took a moment to look at the runway that’s built on poles on the sea, to make it long enough for big planes. Imposing! And the motorway too goes through the runway poles. After the airport, back in the city and ready for a dinner, after an enjoyable Santana day trip from Funchal!